There are tons of devices that are WiFi compatible and what do you have? an iPhone, iPad or Android phone/tablet? I’ve got an iPhone and an iPad but my iPad is not the 3G-enabled version so basically I can’t get online on it without connecting to a WiFi network. I guess many people would suffer from the same issue with reaching the Internet like me if they are somewhere without a wifi router and provides only cabled connection. How to solve this if you are desperately in need of connecting to Internet on your devices? Virtual WiFi router is the answer. In this post we’ll introduce to you the best Virtual WiFi Router Software. What is a Virtual WiFi Router? 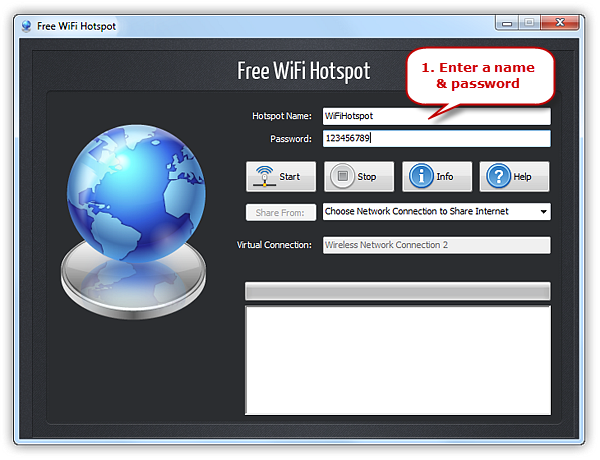 Virtual WiFi router is usually a software tool, which can be downloaded, installed and ran on your computer. 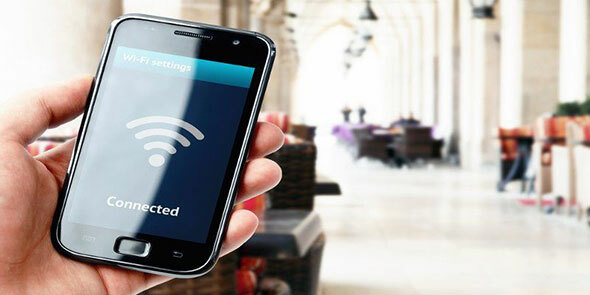 It can create a hotspot, sending WiFi signals to share the existing network connection with other WiFi-enabled devices. It literally makes your computer work like a real WiFi router. 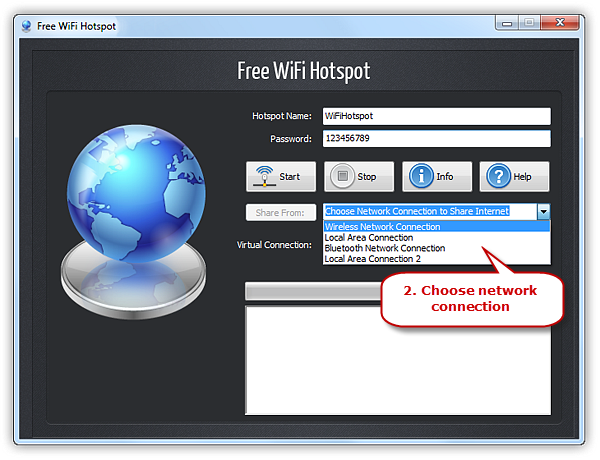 Free WiFi Hotspot stands out from the mass of free WiFi router software. 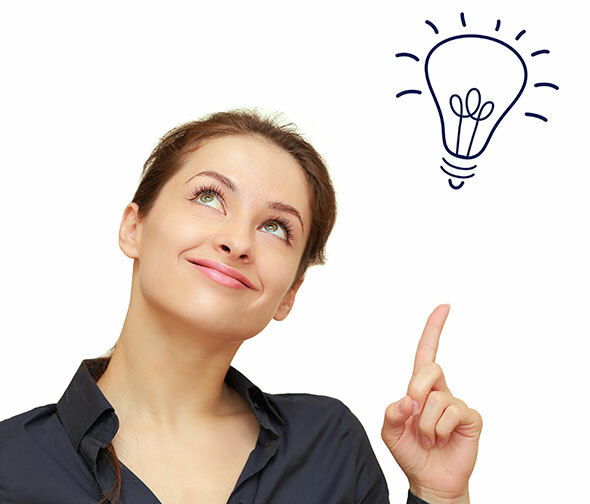 As stated in the name, it is completely free, without any type of malware to bother you or any form of payment or hidden cost. It does not require any registration or your personal info. Do all the things above and more without buying a 4G dongle or other extra hardware. 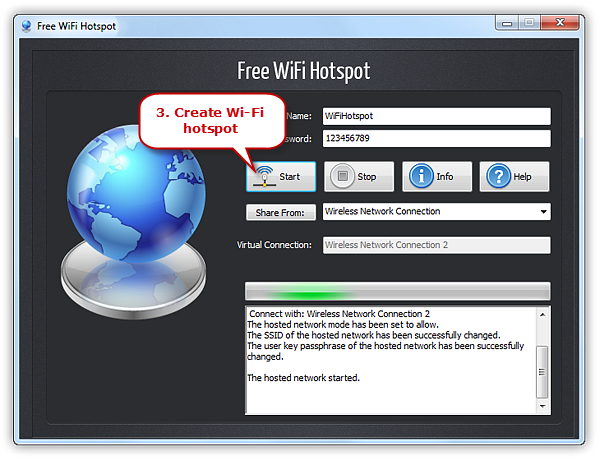 Download Free WiFi Hotspot and install it on your laptop. Set the SSID and password. There are default SSID and password there but we suggest you change that for security’s sake. Also, use a complicated password. If you are creating a guest WiFi network, do not use the same password as your own WiFi. Choose the network type you want to share. You MUST have an existing network that is working properly. In the “Share From” menu, you can see all the detected connections. Free WiFi Hotspot can share network connection from DSL network, Blue tooth, 2G/3G/4G USB dongle, GPRS, etc. Just pick the one you want to share from the menu. Hit “Start” and the hotspot will be working and sending signals. Now look for the hotspot name (SSID) you set on your devices and connect to it with your password. You can see the connection status in the blank field below. Click “Stop” if you need the WiFi no more. Now you can have fun or go on with your business on your device. You may want to: watch YouTube video or Netflix series on your iPhone; launch your stock market analysis software or freight broker software to look out for your business; lay on the sofa, reading online novels or comics on your kindle; playing the most popular mobile games on the large tablet screen; get some quality online courses on your laptop to make a meaningful day; or just enjoy some pleasant video chatting time with your families and friends far away.